Today is one week out from the May 31 deadline for the NBC Universal Writers on the Verge Program and the Warner Bros. Writers' Workshop. I was even thinking of blogging about it, but there didn't seem to be much to be said except that the deadline is in a week, so I had decided not to bother. Writing scripts is only part of the job in television. You also have to be pleasant to work with, cooperative and know your place in the food chain. A fledgling writer is in no position to make demands. Read that comment. Never mind that English might not be this person's first language. The grammar isn't the problem. It's the attitude. Would you hire this person? Especially for a job that has way more people wanting in, who know how to conduct themselves professionally, than there are positions available? There are other issues with this comment. Many successful writers have tales of having to submit countless times before scoring a meeting with an agent, an editor, or a producer. It's not something that usually happens overnight. I don't know how many writers they select for the program - maybe a dozen - but they must get thousands of submissions. You can't tell me at least twelve of them won't be promising writers with at least a decent attitude. 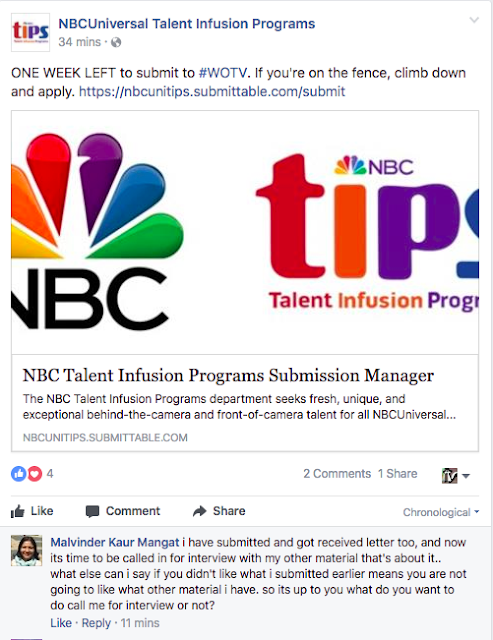 I'd love to be a fly on the wall at NBC Universal to see what they think of this comment and whether it alone torpedoes this person's submission. I do know that this is not how you break in.